I fell in love with Friesians because of the movie Ladyhawke in the 80s. I didn't know what that amazing creature was but I knew I had to have one. 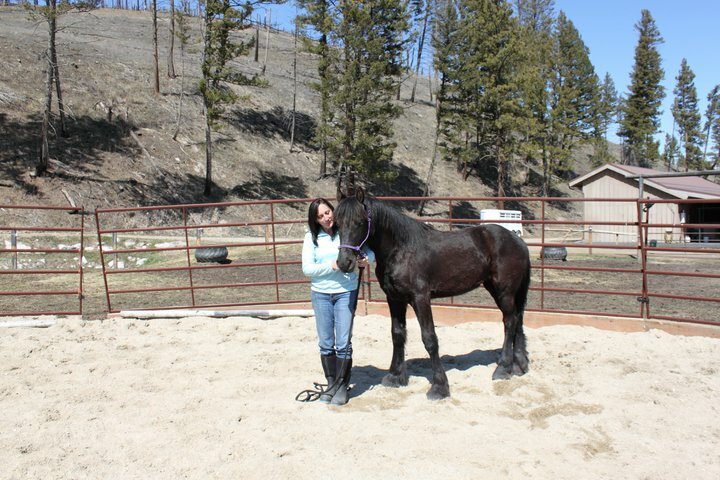 Thirty years later, driving through the tiny town of Sula, Montana I saw a Friesian farm. They had babies! I drove by on a fairly regular basis and one day I stopped to write down their contact information from their sign. I emailed and asked if I could come volunteer - muck stalls, groom, I didn't care - I just wanted to spend time with those beautiful black horses! I started spending every weekend at the farm and fell madly in love with a 6 month old filly named Izarra. She was my love. I bought her and planned a future of great things for her. Sadly, Izarra died when she was 18 months old. My heart was broken. But....the farm was going out of business and selling all their horses and I had purchased Izarra's mother who was pregnant with Maximus. And so it began. 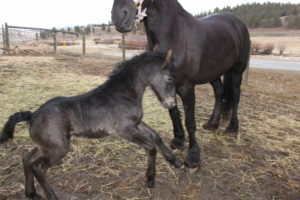 We now have five Friesians and I have never looked back!